There is one complete authentic Romanian costume in our collection pictured here. It was donated to the group by Audrey Steele. Romanian costume is rich in embroidery and geometric design. This one has a fote, a kind of double apron, worn at the front and the back. 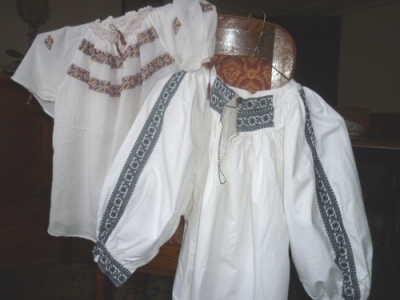 We also have two Romanian blouses, the short sleeved one has crossstitch embroidery and was made in Transylvania. The other with black embroidery is typical of Oltenia.